When up-and-coming chef Michael “Blue” Whitley returns with th In the tradition of Neil Gaiman (The Ocean at the End of the Lane), Scott Smith (The Ruins), and Jason Mott (The Returned), award-winning playwright Robert Levy spins a dark tale of alienation and belonging, the familiar and the surreal, family secrets and the search for truth in his debut supernatural thriller. To ask other readers questions about The Glittering World, please sign up. is this a scary book? i read the caption it sounds like good book. La La - Everyone's Crazy Aunt It will give you the willies a few times. The visuals are stellar! is this a kind of romantic book? it doesn't sound like it but I wanted to make sure. sounds awesome though! J.K. Hogan No, not romantic. A group of four friends travel from New York City to Cape Breton Island to oversee the sale of a home in beautiful Starling Cove. Blue, the man who inherited the property following his grandmother’s death, needs the cash to pay off some shady mobsters who had funded his expanding restaurant in Brooklyn. Originally from Cape Breton but having left at a young age, Blue barely recalls his home town outside of a few fleeting memories. All that changes when he visits his grandmother’s home and vision A group of four friends travel from New York City to Cape Breton Island to oversee the sale of a home in beautiful Starling Cove. Blue, the man who inherited the property following his grandmother’s death, needs the cash to pay off some shady mobsters who had funded his expanding restaurant in Brooklyn. Originally from Cape Breton but having left at a young age, Blue barely recalls his home town outside of a few fleeting memories. All that changes when he visits his grandmother’s home and visions begin flooding into his brain, threatening to unravel his sanity. It was an interesting experience to read a story set near my home town. Local businesses such as Needs (local convenience store) and Frenchy’s (a used clothing outlet) make cameos within the first dozen pages and while the town of Starling Cove doesn’t exist, it’s surrounded by real locations such as Kelly’s Mountain and Baddeck. While there are a few questionable geographic discrepancies, Levy states in the acknowledgements that things may have shifted in the course of his writing. It’s difficult to argue a strict adherence to geography given the creation of a fictional town – it’s honestly something I only noticed given that I’m from there and I doubt it takes much away from the story. For a debut novel, Levy certainly shows talent with regard to pacing. The story progressed smoothly which had me turning the pages, reading it in large chunks. As far as criticism goes, I would note that he relied a little too heavily on adjectives in that the story felt overwritten at times. That being said, I haven’t read a lot of fantasy so it’s possible he’s exploring a style I’m not entirely familiar with. Imagine: Kelly Link's "The Summer People" meets Elizabeth Hand's "Last Summer at Mars Hill" with a bit of the 'feel' of Graham Joyce (especially 'Some Kind of Fairytale'). If you haven't read those other stories, go read them now. But read this book too. Blue is a young New York City restaurateur. Recently, the grandmother he never knew passed away, leaving him a cottage in the small community where he lived as a child. All he knows is that his mother left the place - some kind of hippie commune Imagine: Kelly Link's "The Summer People" meets Elizabeth Hand's "Last Summer at Mars Hill" with a bit of the 'feel' of Graham Joyce (especially 'Some Kind of Fairytale'). Blue is a young New York City restaurateur. Recently, the grandmother he never knew passed away, leaving him a cottage in the small community where he lived as a child. All he knows is that his mother left the place - some kind of hippie commune - and hated his grandmother. He's arranged to sell the house to pay off some debts, but figures he might as well see the place at least once before it's gone. And hey, it's a good excuse for a getaway. He travels up to the rural community along with his best friend, her husband, and the young bus boy from his restaurant who's recently fallen into an obsessive friendship with him. Once at their B&B, they're made welcome by the locals. (Maybe just a little bit too welcome.) But perhaps there was a reason Blue's mother made him promise to never visit this town. It might be related to the reason that Blue has very few memories from his childhood. And the tall tales that the eccentric locals tell about faeries gradually become more and more inescapable. I found some of the details here fun but slightly distracting - the characters mention partying at Limelight, which is a club I worked at. That facet of their past did not endear them to me (although I got over it). Then, there's a mention of an incident where it becomes apparently that one of the main characters was a regular at the Slipper Room. (And drag king Murray Hill is performing!) Now, that's a night I might've been at! However, if you wanna be very nitpicky, x parties at Limelight and Murray Hill at the Slipper Room were not concurrent events. There's a few years between those two. And a Venn diagram describing the group of people who voluntarily attended both types of event would show the overlap to be very small (although not nonexistent). However, pretty much no one else in the world who reads this book is going to care about that... it's just background info. Overall, this book is an excellent mix of faerie fantasy and contemporary thriller. An impressive debut. Many thanks to NetGalley and Gallery Books for the opportunity to read this book. It was right up my alley! As always, my opinions are my own. I kept scowling at the page thinking, really, she settled on her sit bones? Why not just say she is in the passenger seat? And for much of the beginning, the author makes the mistake of spending too much time on the details that don't matter, to the extent that it is difficult to focus on what is important. Unless this is just some fae magic, I'm not sure. What I'm sure of is that this is a first novel, because passages like this give that fact away. For some reason I picked it back up, giving it the benefit of the doubt, and found I somewhat enjoyed the story. The stakes seemed higher than in many faerie stories and I liked the complex relationships between the four major characters. I wanted to know more about Blue and I wanted to know about the "other folk" in the forest. I love the setting, Nova Scotia, so that may have saved it for me more than anything. Also this is one of the more beautiful book covers I've seen in the last few years. I think if you are into urban fantasy or the fae, this will be more of a book for you than it was for me. I think I have a 'Love/hate' relationship with "The Glittering World". I basically haven't slept because I was completely swept away in the world of fantasy-fiction last night with Robert Levy's storytelling. I immediately sent my friend an e-mail, saying In was 'mad'. How could this novel end the way it did without havin I think I have a 'Love/hate' relationship with "The Glittering World". I basically haven't slept because I was completely swept away in the world of fantasy-fiction last night with Robert Levy's storytelling. Much of this story is exquisite-a very enchanting fable. "Do you believe in fairy's"? "The Other people"? I sincerely raise my eyebrows in wonder. This is a very richly suggestive novel...captivating immediately! Its well worth reading. The community & characters are worth it alone! ...I may have just been impatient --because I just wanted to have BLUE back in the story, so I must take that into account too. (In adored the character). Besides, could he 'cook'! I look forward to reading more books by Robert Levy. I'm a fan already! I enjoyed his writing -his warmth and intimacy. Thank you, Netgalley! Deeply appreciated! Congratulations, Glittering World! You have the dubious honor of being the first DNF I've ever listed on GoodReads! I got maybe halfway and skimmed the rest. What makes it worse is that I picked this for book club, and now I don't know if I can show my face there again (Sorry, guys. If I show up at dinner with a bag over my head, you know why). So why did I choose it? I don't know. The premise and genre-blending sounded interesting. Reviews were promising. And okay, the blurbs! I should really, r Congratulations, Glittering World! You have the dubious honor of being the first DNF I've ever listed on GoodReads! I got maybe halfway and skimmed the rest. What makes it worse is that I picked this for book club, and now I don't know if I can show my face there again (Sorry, guys. If I show up at dinner with a bag over my head, you know why). So why did I choose it? I don't know. The premise and genre-blending sounded interesting. Reviews were promising. And okay, the blurbs! I should really, really know better. But seriously, okay, the blurbs? An author is never as good as who he's compared to in the blurbs, but when a book is likened to "True Blood crossed with Margaret Atwood," Elizabeth Hand calls it "one of the strongest literary debuts of recent years" and Kelly Link "love[s] it," it makes me think, "Okay, maybe this is worth a shot." There was nothing to excite me about this book. It was not scary or suspenseful or magical or deep. It was really just, well, blah. Writing, dialogue, pacing, format, characters--none of it did anything for me. I had to stop every couple paragraphs to laugh, roll my eyes, or just shout, "What?!" Oh, and sometimes, "Eew." I sort of feel like a more skilled writer could have taken this idea and turned it into something worthwhile, because I do like the bare bones premise. But Levy just wasn't able to build suspense or make his world believable to me, and a lot of it just seemed silly. Robert Levy's The Glittering World is that rare and wonderful kind of book that takes something old and makes it new again. Like those who disappear into the woods in this novel, once you step into these lush and mysterious pages, be prepared to return to your own world altered. I can't rate this because I don't know wtf I just read. It's a changeling story, it's creepy, atrocious on certain parts, and told in an alien-abduction kind of way. The style is very literary fiction, suspenseful and mysterious. This is jut one strange cookie. There is a lot to like about Robert Levy's debut novel. There's the seemingly idyllic location of Starling Cove in Cape Breton, Nova Scotia, the writer's strong character development, and frequently stunning prose, to name a few. The Glittering World is the story of Michael "Blue" Whitley and his closest friends, Elisa and her husband Jeremy, & Blue's young and admiring co-worker, Gabe, who all travel from NYC, to the place of his birth, essentially to facilitate the sale of his late grandmother's home. "All four will face their troubled pasts, their most private demons, and a mysterious race of beings that inhabits the land, spoken of by the locals as only the Other Kind..."
If I had to pick a genre for The Glittering World, I'd call it literary horror. Nothing wrong with that, but there were times when the story slowed considerably because of to too much extrapolation and not enough action. I did mention Robert's beautiful prose, but there were also many times I found it to be cumbersome and a bit of a distraction Too much of a good thing. In conclusion, there is a hauntingly beautiful story hidden amongst all the words. One that many readers are likely to enjoy. Robert Levy’s debut novel is a difficult one to classify. Billed by the publisher as a supernatural thriller (which it unequivocally is), it also sporadically plunges headlong into contemporary fantasy, mystery, fairy tale, and what could be described as rural noir. There’s much going on here, but it works, and at its core The Glittering World is really a love story that’s fantastic in every sense of the word. Michael Whitley (also known as Blue) and three close friends have left New York to go a Robert Levy’s debut novel is a difficult one to classify. Billed by the publisher as a supernatural thriller (which it unequivocally is), it also sporadically plunges headlong into contemporary fantasy, mystery, fairy tale, and what could be described as rural noir. There’s much going on here, but it works, and at its core The Glittering World is really a love story that’s fantastic in every sense of the word. Michael Whitley (also known as Blue) and three close friends have left New York to go and settle some of Michael’s late grandmother’s affairs in Starling Cove, a small community in Nova Scotia, Canada. It’s the first time Michael’s been to Starling Cove since his mother fled there with him when he was a child. His memories of the place and its strange denizens are tenuous, but soon begin to return unbidden. As this happens, against his better judgment and the counsel of others, he’s drawn with an almost magnetic propulsion to the nearby woods, which hold secrets of their own. Complicating things further is the magnetic pull Michael himself seems to have on his longtime friend Elisa, and Gabe, the young man enamored with and devoted to Michael. Somewhere in the middle of this is Jason, Elisa’s husband. As much as this may sound like a typical love triangle (or square) shoehorned in, it’s anything but. The attraction and relationships between the characters are part of the backbone of the plot and integral to the story’s supernatural aspects. The main characters are impeccably drawn and very much likable, flaws and all. Each of the book’s four sections is written from a different perspective, and each character has a distinctive voice that moves the plot quickly along while deepening and slowly unraveling its mysteries and unexpected twists. The story goes to some very dark places, both fantastical and of a more realistic variety. The creatures inhabiting the woods and the ground beneath are at once beautiful and terrifying, familiar and alien, but the Starling Cove locals have some monstrous aspects in their own shared history. There’s a heavy emphasis on the bonds of family in its many forms, and even the human element here is imbued with a palpable sense of magic. Clever, different, creepy, adult, and difficult in the right ways. A very impressive debut! This had such a promising start, but it just never delivered for me. I didn't care even slightly about any of the characters. The writing was totally bizarre--the metaphors were genuinely often distracting, and would jar me out of the narrative. But the thing, I think, that really killed it for me was that all of these characters are in thrall to "The Other Kind" for reasons that I just never felt. The way The Other Kind are described is unremittingly disgusting, and we are told repeatedly that This had such a promising start, but it just never delivered for me. I didn't care even slightly about any of the characters. The writing was totally bizarre--the metaphors were genuinely often distracting, and would jar me out of the narrative. But the thing, I think, that really killed it for me was that all of these characters are in thrall to "The Other Kind" for reasons that I just never felt. The way The Other Kind are described is unremittingly disgusting, and we are told repeatedly that their smell and their touch etc. is LITERALLY INTOXICATING, but from the writing I never felt it in a visceral way. Which just made all the characters seem crazy. Especially when I got to Gabriel's chapter. I really wanted to like the kid, but the writing in his chapter was particularly obnoxious and made him seem almost schizophrenic. I feel that that must have been somewhat intentional, but it just didn't work for me. When I saw that the blurb for the Glittering World compared it to Neil Gaiman, I knew I wanted to read it. Neil Gaiman is amazing. I adore everything of his that I have ever read and I adore him. I may have a wee bit of a fan girl crush on him…. HOWEVER, that is not the point of this post. This is about The Glittering World by Robert Levy. Which, so far, is a good book; quite good in fact. When I requested a copy of this book, I didn’t know anything about it, other than its comparison to Neil Ga When I saw that the blurb for the Glittering World compared it to Neil Gaiman, I knew I wanted to read it. Neil Gaiman is amazing. I adore everything of his that I have ever read and I adore him. I may have a wee bit of a fan girl crush on him…. HOWEVER, that is not the point of this post. 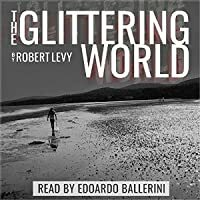 This is about The Glittering World by Robert Levy. Which, so far, is a good book; quite good in fact. When I requested a copy of this book, I didn’t know anything about it, other than its comparison to Neil Gaiman (swoon) and I was seeing it all over the bookish world or my little corner of it anyway. So I was not expecting this story to take place in Cape Breton, let alone in Canada. Michael “Blue” Whitely and three of his closest friends are making their way to Cape Breton from New York City to facilitate the sale of Blue’s deceased grandmothers house. Right from the beginning of their trip though, things seem a little off. Blue is nervous about making his way back to his childhood home and tells everyone that he remembers nothing about it, his mother doesn’t want him to go, and Blue doesn’t tell any of the locals they meet that he spent his early childhood living in the local commune, or even the real reason for his visit. It’s pretty clear that Blue is not even sure of his reasons. He could have sold the house in absentia, but he feels compelled to visit once more, telling himself that he needs a break from all of his New York problems – where his restaurant is not doing that well and he owes a lot of money to some unsavoury characters. His friends, who know a little bit more than everyone else, all have their own issues as well. Elisa & Blue, best friends since their drugged out, rave attending, dancing the night away, teenage years seem to be a little too close, while Jason, Elisa’s therapist husband watches on. And then there is Gabe, a lost youth who clings to Blue a little too fiercely and a little too longingly. They all seem like people trying to run away from something, but like most of us, they are running in the wrong direction. On their first night in Cape Breton, things start to go awry. Blue is seeing and hearing things and he and Gabe learn a potentially dangerous secret about Elisa. The next few days pass relatively normally, with the four of them doing some touristy things, but Blue’s visions and audio hallucinations grow and grow until the day he visits his grandmother’s house where he recalls a memory so vivid and horrific that he’s not sure he’ll ever recover. That night, he and Elisa disappear. The next part of the book starts 10 days after the disappearance, with Jason and Gabe frantically trying to find Blue and Elisa, and wondering why they have disappeared. The police are doing as much as they can, but there are forest fires in the area and missing hikers. This is also where we start to learn a little more about Blue and the reason for his visions… and we learn more about the fairy folk living under ground in this Cape Breton community, and what they might have to do with Blue and Elisa’s disappearance. Cape Breton is an area rich with legend and folklore, and Levy has done a great job of making it come to life. I would think that it would be impossible for anyone today to not have heard stories about fairies, or fey, or changeling babies being swapped for humans, but in Cape Breton there are (or were) many who believe these stories to be true. They are direct descendants from Scottish Highlanders, where these stories weren’t stories but fact, and although many claim to not believe, superstition runs deep and beliefs are not always acknowledged. He’s also done a fairly good job with the main characters, they are well fleshed out, although mid-way through there is definitely some more character building to be done, and I do find that some of the back stories are a little cliché. His secondary characters though, are wonderful. Maureen and Donald, who own the house where the 4 friends are staying, and where Jason and Gabe plan their search, are perfectly drawn. Donald, the scientist turned believer, is losing his mind and potentially finding his way to the fairies, and Maureen, once a young mi’kmaq girl who is now trying to pretend that she doesn’t believe the old legends. There is Fred Cronin, who without a doubt knows the fairies exist; and then there is Daniel Jessed, the police officer liaising with Jason and Gabe, who although we have not spent much time with him, has a dark secret of his own. The Glittering World is a book with a very different take on the fae. I could go on for hours about the uniqueness of the author's vision, but I think that's better discovered by the reader. What I will say however, is that I found the method Levy chose to use to communicate the story extremely interesting. Told from the point of view of four different protagonists, you'll find yourself wondering whose story is it really? How is it possible to really tell? Arguably, Blue goes through the largest The Glittering World is a book with a very different take on the fae. I could go on for hours about the uniqueness of the author's vision, but I think that's better discovered by the reader. Arguably, Blue goes through the largest change, but I think Gabe makes the biggest transformation, going from a meek, addict-like personality to a strong individual in his own right. But even this character development feels incomplete, given his lack of presence and personality in the first half of the book. You discover new things about each of the four (Blue, Elisa, Gabe and Jason) as you shift to another person's perspective. None of the characters are simply parts of a puzzle, however they're too tangled up in each other to be anything but. Much like the role of the fae in our human world. Strange thing: I finished reading this book at a cafe in my neighborhood and then looked up the author on FB. One of the first pics is of the author standing in the same cafe about 4 feet from where I'm currently sitting. A very engaging, character-focused story that hooked me right from the beginning. There are four main characters -- Blue, Jason, Elisa and Gabriel -- and about a quarter of the book follows the perspective of each. 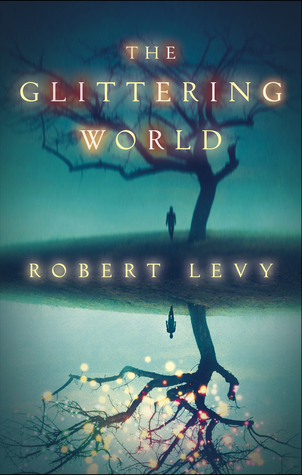 The Glittering World is the first thing I've read by Robert Levy, and I enjoyed it so much I'll definitely seek out his work in the future. I received this book from Netgalley in exchange for an honest review. The marketing compared it to Neil Gaiman, so I was intrigued. I can see where the comparison comes in for sure. It's a modern-day fantasy in which an ex-club-kid turned chef returns to his roots only to discover that he is not the person he's always thought himself to be. I wasn't really sure what to expect, since the author was unknown to me, and urban fantasy isn't typically my thing. Robert Levy is, luckily, a skilled write I received this book from Netgalley in exchange for an honest review. The marketing compared it to Neil Gaiman, so I was intrigued. I can see where the comparison comes in for sure. It's a modern-day fantasy in which an ex-club-kid turned chef returns to his roots only to discover that he is not the person he's always thought himself to be. I wasn't really sure what to expect, since the author was unknown to me, and urban fantasy isn't typically my thing. Robert Levy is, luckily, a skilled writer. A Harvard grad and forensic psychologist with a taste for the dark and mystical. He's also an award-winning playwright, although I'm not sure which plays he's written. I gave the book three stars because, although the writing was good and I enjoyed the story overall, the writing suffered a bit from trying to be an ensemble piece rather than telling one person's story. In the end, I felt like I didn't quite get enough of any one person's story and almost every story left left off before it was really over. The book starts off from the point of view of Michael Whitley, aka Blue, who is returning to his birth place to sell off the home his grandmother left him. He hasn't been there since he was a child and his return sets off a whole series of events that reveal his true nature. Hint: he isn't really human. One Blue discovers his true nature, he disappears and the story leaves him and jumps to another point of view. Jason, the husband of Blue's best friend takes over for a while, then Jason's wife Elisa, then finally Blue's young companion Gabe. While the perspective shift is necessary to reveal the history and internal thoughts and motivations of each character, that necessity means that each time the perspective shifts, you cease to understand the thoughts, feelings and motivations of every other character, since they are all secretive, opaque, hiding their true feelings and motivations from each other. You begin the story thinking Blue is the main character, but only about 1/4 of the way in, he largely disappears, except as a thin, ghostly alien presence who only communicates in the vaguest of ways. It becomes difficult to care or root for any character because as soon as you begin to care, their point of view is withdrawn and they all but leave the story or cease to exist in any meaningful way. I found the story to have a lot of beauty and the plot was well-paced, making it a page-turner but ultimately I felt a bit empty at the end. I wasn't entirely sure of the purpose of the story and I had a hard time feeling closure, as each character's ending but one was seen from someone else's point of view, so you had no idea what any of them were thinking or feeling as they reached their resolution. I guess that ultimately makes it Gabe's story as you are left, in the end, with his point of view and his resolution. It's hard to feel satisfied with that, though, since you know almost nothing about him for 3/4 of the book. Returning to Blue after Gabe's ending could have provided a richer conclusion, with insight into how he thought and felt after returning to his true self and some true closure on what really should have been his story all along. When a publishing house decides to market a book - and it often seems to happen with debut novelists - by comparing it to the works of well known and beloved authors, I have a tendency to cross my arms and stamp my foot and declare a general intolerance for such buffoonery. And... I tend to fall for it pretty much every time. Which is, of course, what the marketing department is hoping for. When Gallery Books offered Robert Levy's new novel, The Glittering World up for early review with the claim When a publishing house decides to market a book - and it often seems to happen with debut novelists - by comparing it to the works of well known and beloved authors, I have a tendency to cross my arms and stamp my foot and declare a general intolerance for such buffoonery. And... I tend to fall for it pretty much every time. Which is, of course, what the marketing department is hoping for. When Gallery Books offered Robert Levy's new novel, The Glittering World up for early review with the claim that it is "in the tradition of Neil Gaiman," I snorted and rolled my eyes... and immediately requested it. I annoy myself when I fall for "It's just like Tana French!" or "If you love Neil Gaiman, you'll love this!" but I do it. You know who is just like Tana French? Tana French. You know who is just like Neil Gaiman? Neil Gaiman. And guess who Robert Levy is like? Robert Levy. I like all sorts of stories. Fiction, non-fiction, romances, history, contemporary, graphic novels and memoirs, and thanks to Station Eleven, I'm even exploring genres I've tended to pass over in the past. But if I'm to declare a list of absolute favourites, anything with a reference to myths, legends, or fairy tales rendered in a contemporary fictional setting absolutely lands within the top three. The Glittering World opens with four friends traveling together from New York to a remote Canadian community, where one of them grew up in a commune. The novel is broken into four parts, each one told from the point of view of one of the four characters. The first story is Blue's narrative and although, of course, every story must start somewhere, I felt like my perception of Blue perhaps suffered a bit from his story being first. Blue's character is intended to come off as irresistible to everyone around him; sensual, sexual, charismatic. Unfortunately, being introduced to such a character from his own perspective made him seem, to me, to be quite narcissistic and rather uncaring towards all these people who are drawn towards him. I'm not entirely sure whether this was Levy's intention, as further in the book when we see Blue from the perspectives of others, my attitude towards him softened slightly. I finished this novel with conflicting responses. Much I what I yearn for when I pick up a novel that promises these fantastical elements was certainly met with Levy's novel. Sometimes, in other novels of similar ilk, I feel like the author's tendency, when faced with fairy-tale or mythical elements, is to romanticize or soften the edges of those elements, which always lessens the point to me. Like all the whitewashing of Grimm's original fairytales. Those novels often end up feeling more like a step above children's stories, or created more for a young adult genre. Levy doesn't hesitate to make this an adult novel - gritty, sexual, hard edged and realistic in concrete details ranging from relationships to the actual physical world. This, I liked. It's what I want, the elements of why I'm drawn to these darker stories in the first place. Where my response conflicted was, perhaps, the other side of the coin. Where Levy created an excellent representation of a darker world, he made it so dark and gritty that I had much difficulty in understanding why any of the characters, save for Blue, would ever wish to return or reside in that world. There's glitteriness, yes, and apparent wisdom, but all of the disturbing physical elements inherit in the world made it seem intolerable for a physical being not created for such a world to remain within it, and no amount of glitteriness Levy created could convince me otherwise. So, sure, I'm going to say that if you like Neil Gaiman, you may enjoy The Glittering World, but I encourage you to approach Levy's creation as his own and appreciate the strength of his words and engrossing, disturbing world. I received a complimentary copy of this book from the publisher via NetGalley in exchange for an honest review. Chef, Michael Whitley--known to his friends as Blue, inherits his grandmother’s cottage in a bucolic community in Nova Scotia. His friends Elisa, Jason and Gabe accompany him to Starling Cove in the Cape Breton area to see the house one last time before Blue signs off on the sale of the property. The community of free-thinking, aging hippies and artists warmly welcome the New Yorkers. As I received a complimentary copy of this book from the publisher via NetGalley in exchange for an honest review. The community of free-thinking, aging hippies and artists warmly welcome the New Yorkers. As their stay progresses, tensions rise and the friends are a little less comfortable with one another while their neighbors behavior becomes stranger. Blue eventually goes to his grandmother house and discovers something in the basement that opens a fissure in his mind, and the memories gush to the surface. Life will never be the same for Blue and his friends once they unravel the secrets of Starling Cove and the remnants of the one time artist colony and commune. Robert Levy’s first novel is magical yet dark and somber. It’s an exploration of loss, longing, fear, and the need to belong. It’s a search for meaning and desire. Levy blends faerie folklore, mysticism, mythology, and even a little Hermeticism to create an earthy, pungent world where the Other Kind observe and interact with humans. The Other Kind secretly live in Levy's vibrant, almost psychedelic, underworld. This suspenseful and enthralling fantasy reaffirms the circle of life with analogies of bees, other insects and the living forest. The myth of the Green Man comes to mind: a symbol of rebirth, representing the cycle of decay and growth; a vegetative deity. Levy’s story is told in four parts; each part is told from the perspective of one of the four friends. Through each of their points of view, the overall story progresses while the reader learns more about each character’s past traumas and demons. In different ways, the characters are given the chance to open themselves up to new possibilities or close themselves off and live in the tight boundaries that (human) society defines for them. While I did find the descriptions magical and the mystery and suspense gripping, I felt the author tried entirely too hard to incorporate as many three and four syllable words as he could. Usually, I thoroughly enjoy reading a book that contains a few words that drive me to open a dictionary, but Robert Levy’s thesaurus needs a rest. The cover perfectly depicts the essence of the story. The Glittering World by Robert Levy is a high voltage wire humming with power and energy. 2.5 stars. I requested/downloaded this book from netgalley.com because of its comparison to Neil Gaiman's The Ocean at the End of the Lane, which I loved. This book had some of the fairy tale aspects of Gaiman's but didn't really live up to the comparison. The story revolves around Blue and his friend Elisa, her husband Jason, and Blue's puppyish hanger-on, Gabe. Travelling to Nova Scotia for Blue to sell his dead grandmother's house and take a little vacation, Blue begins to uncover hazy memori 2.5 stars. I requested/downloaded this book from netgalley.com because of its comparison to Neil Gaiman's The Ocean at the End of the Lane, which I loved. This book had some of the fairy tale aspects of Gaiman's but didn't really live up to the comparison. The story alternated between engaging and tedious. Blue is supposed to have this unnatural charm and obviously Elisa and Gabe are under his spell, but Jason isn't. And there isn't really an explanation. I wanted to know more about the Other Kind but the story was told in alternating perspectives: Blue's, Jason's, Elisa's and Gabe's, and we never got into Blue's head once the first section was done. And Gabe's whole section was very inconsistent. (view spoiler)[ The boy in the attic cabinet was real and then not real. He worships Blue and yet opts to leave him. (hide spoiler)] It was just... unsatisfying. Thank you Netgalley and Gallery Books for my ebook copy of this book. Although I think that this book has a decent writing style, I found it to be trippy and unsatisfying. The plot itself is unique and it held my attention but the details were too psychedelic for me to fully understand anything. "The Other Kind" are described to be like huge Praying Mantis' that can take the form of people but I can't say I have a full understanding as to what they are or what their purpose was exactly. The plot surrounding the humans was very interesting without the fantasy elements. In a way, I wish the book was just about its' characters and their relationships. It ends with a vague outlook for the future of its' characters and the reader with more questions than answers. I don't regret reading it but it had the potential to be better. I received an e-copy of this book from net galley. I loved this book, at first I was worried because I thought that the plot was moving too fast. However, this was just me guessing at where I thought the book would go, but I was wrong. I found all of the characters enthralling, none of them seemed to have bad points, yet I found myself loving them all. There aren't too many characters within the book, so it feels self-contained, and it really adds to the feel of the book. The atmosphere of the n I received an e-copy of this book from net galley. I found all of the characters enthralling, none of them seemed to have bad points, yet I found myself loving them all. There aren't too many characters within the book, so it feels self-contained, and it really adds to the feel of the book. The atmosphere of the novel is one of mystery, and deep-rooted fear. The creatures in the book are never fully explained, yet I didn't actually want any more information about them, I was content to make my own theories. I devoured this book, I was enthralled and captivated. I really can't find any bad points about it. The plot is exciting and imaginative, the characters are interesting, and the changes in points of view within the book reveals details to the reader that would otherwise not be known. The first half of The Glittering World was a lovefest for me, I was devouring it. Number one, it has a road trip. Blue has inherited a house in Cape Breton from his grandmother. Against his mother's wishes, he and three friends head to Nova Scotia for a look at the place before the sale is finalized. Number two, in chronological order, the narrator shifts from one main character to the next. This was an interesting literary device that worked well. Three, and this was the most exciting thing, th The first half of The Glittering World was a lovefest for me, I was devouring it. Number one, it has a road trip. Blue has inherited a house in Cape Breton from his grandmother. Against his mother's wishes, he and three friends head to Nova Scotia for a look at the place before the sale is finalized. Number two, in chronological order, the narrator shifts from one main character to the next. This was an interesting literary device that worked well. Three, and this was the most exciting thing, there were faeries. Not Disney fairies with gossamer wings, but the fey of dark literature. The second half of the book lacked the requisite tension that should have intensified with every page. Beautifully written, but the promise of the first half slowly seeped away. This is a first novel by playwright Robert Levy and I expect better things are on the way. I don't understand why this book has such low ratings! Maybe I'm a little biased since I'm a long-time resident of Nova Scotia and Cape Breton is my favorite place in the world, so this book brought back a lot of memories of childhood nostalgia, those wonderful times in the backseat of my parents' van while we drove to beaches, green fields, the steel mill museum and North Sydney, those days when I still thought that life would always be one perpetually glorious, yellow-tinted Kodak moment... but I don't understand why this book has such low ratings! I adored this book. It's compelling, wonderfully written, and ingeniously plotted. I'm a sucker for a well-done shift in point of view and it's masterful here. Most importantly (at least for holding my interest), I immediately wanted to be friends with these characters. A great story on so many levels. Enthusiastically recommended! This one started out really strong but grew steadily worse until I was just skim reading to the finish. Unlikeable people doing horrible things and making stupid decisions. I will say that the characters were well crafted, but like good actors in a bad movie there wasn't much for them to do. I got a copy of this book to review through NetGalley. I am going to be completely honest here, the only reason I read the synopsis for this book and subsequently request it for review was because I though the cover was absolutely gorgeous. It ended up being an interesting read that reminded me a lot of Elizabeth Hands stories (Waking the Moon, Blacklight). Michael “Blue” Whitley returns to his home village of Starling Cove, a remote town in Canada to sell his grandmother’s house. He is a success I got a copy of this book to review through NetGalley. I am going to be completely honest here, the only reason I read the synopsis for this book and subsequently request it for review was because I though the cover was absolutely gorgeous. It ended up being an interesting read that reminded me a lot of Elizabeth Hands stories (Waking the Moon, Blacklight). Michael “Blue” Whitley returns to his home village of Starling Cove, a remote town in Canada to sell his grandmother’s house. He is a successful chef but deeply in debt after starting his own restaurant. Three of his friends; Elisa, Jason, and Gabe accompany him. When Blue gets to Starling Cove things start to get weird, Blue disappeared into the Starling Cove woods for 2 weeks when he was younger and couldn’t remember any of that time. Now that Blue is back he is hearing voices and the woods are calling to him. Blue will find that the truth of Starling Cove is stranger than he ever imagined. This was an interesting book. It has a very dreamy quality to it. The book is broken into four section and we hear from each of the characters in those section. First we hear from Blue, then Jason, then Elisa, and then Gabe. Each section is further along in time...so the story progresses in time but is told from a different viewpoint. The dreamy quality and the magic that at first seems to be mystical realism but ends up being something far stranger reminds me of Elizabeth Hand’s books. This book is also compared to Neil Gaiman’s The Ocean at the End of the Land...and it is somewhat similar to that book in feel as well. Strangely enough the book also has a bit of an alien invasion feel to it. Our character’s run-ins with the Other Kind, commonly called fey by the people in town, are very otherworldly and a bit disturbing. This is an odd little story. I enjoyed it and enjoyed the descriptions, but it is one of those stories that is a bit ambiguous. At the end you are kind of sitting there like...well, okay...what exactly just happened here. Also this is definitely an adult book; there are definitely some disturbing parts in here including torture and some sexual aspects. ROBERT LEVY is an author of unsettling stories and plays whose work has been seen Off-Broadway. A Harvard graduate subsequently trained as a forensic psychologist, his work has been called "frank and funny" (Time Magazine), "idiosyncratic and disarming" (The New York Times), "ambitious and clever" (Variety), "smart" (The Magazine of Fantasy & Science Fiction) and "bloody brave" (the UK's SFX M ROBERT LEVY is an author of unsettling stories and plays whose work has been seen Off-Broadway. A Harvard graduate subsequently trained as a forensic psychologist, his work has been called "frank and funny" (Time Magazine), "idiosyncratic and disarming" (The New York Times), "ambitious and clever" (Variety), "smart" (The Magazine of Fantasy & Science Fiction) and "bloody brave" (the UK's SFX Magazine). His first novel, the contemporary dark fairy tale THE GLITTERING WORLD, was published by Gallery/Simon & Schuster and a finalist for the Shirley Jackson Award as well as a Lambda Literary Award nominee. Shorter work has appeared in Black Static, Shadows & Tall Trees, and Strange Aeons, as well as numerous Year's Best anthologies including Wilde Stories: The Year's Best Gay Speculative Fiction and Best Horror of the Year, among others.